Tampa is a city in the U.S. state of Florida. It serves as the county seat for Hillsborough County and is located on the west coast of Florida, on Tampa Baynear the Gulf of Mexico. 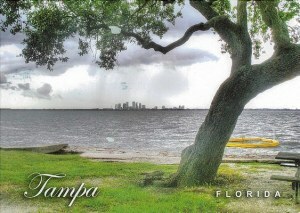 The current location of Tampa was once inhabited by indigenous peoples of the Safety Harbor culture, most notably the Tocobaga and the Pohoy, who lived along the shores of Tampa Bay. It was briefly explored by Spanish explorers in the early 16th century, but there were no permanent American or European settlements within today's city limits until after the United States had acquired Florida from Spain in 1819.